After a very fast and successful 17-day drydocking the cruise ship MSC Magnifica left Damen Shiprepair Rotterdam (part of Damen Shiprepair & Conversion) for Hamburg on schedule to start her next cruise. Next week (December 2) another cruise vessel will arrive at Damen Shiprepair Rotterdam – the 200 m MS Saga Sapphire. In the meantime, Damen Shiprepair Vlissingen recently handled two, 167 m cruise ships, the Astor and Marco Polo. 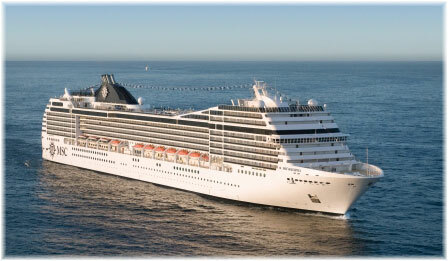 Built in 2010, the MSC Magnifica is 293 m long and has a capacity for more than 2,500 passengers. She arrived at Damen Shiprepair Rotterdam on October 20 and was berthed at the yard’s largest drydock, which is 307 m in length. “Every time the crew members wanted to go into the city, we had to make sure all the safety checks were in place when they were getting on and off but the crew and our team worked very well together,” says Mr Benjelloul. “This was not an easy project but a really enjoyable one,” emphasises Mr Derks.